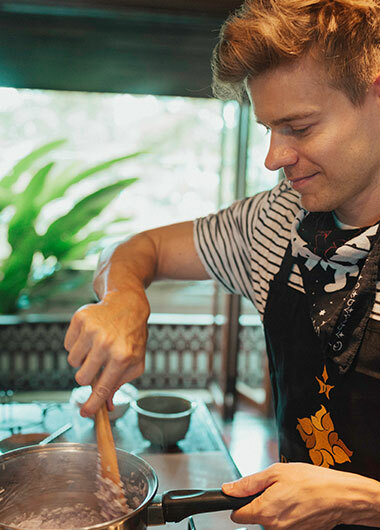 Follow Andrew and Scott on their dream gay honeymoon as they travel around Thailand visiting some of the best hotels in Asia. Andrew and Scott met in 2014 and have been together for four and a half years. Initially set up by a mutual friend the couple married in Oct 2018. While not enjoying lux gay honeymoons, Andrew is an actor, best-selling author, and award-winning filmmaker. He is a Broadway star from shows including Newsies, Tuck Verlasting and Mary Poppins. Scott works as a national reporter for The Daily Beast, a US based online newspaper. Together they live in Brooklyn, New York. Let’s find out more about their gorgeous gay honeymoon in Thailand and their thoughts on the incredible destinations and hotels they visited. To keep up with this adorable couple be sure to follow them on Instagram (Andrew & Scott) and their blog. The Renaissance Phuket Resort & Spa was the perfect way to start off our honeymoon in Thailand. Every aspect of our stay felt like it was designed to help us unplug and relax, from the location — on a pristine, sparsely populated stretch of Phuket’s longest beach — to the grounds, which were lush and well-groomed. Between the huge pool, well-appointed fitness center and the three restaurants to choose from, the Renaissance had everything we wanted to get in the right headspace to relax. The fitness center, open 24 hours a day, is one of the best we’ve ever seen in a hotel, and a great way to feel refreshed before heading out to the beach. A couples Thai massage was a relaxing way to unwind together, as well. The SIS Kata is the perfect hotel for anyone who wants to pair their stay in Phuket with both a fantastic beachside location and cutting-edge cool architecture and design. Every space at the SIS Kata seems primed for stylish selfies set against a gorgeous seaside backdrop. Clean, minimalist decor vibes perfectly with the hip crowd, particularly beside the rooftop pool, which overlooks Kata Beach. Even the dining areas — the breakfast buffet is steps from the pool — make you feel like you’ve stepped into a magazine editorial. The close proximity to both the nightlife of Patong and the scenic views of Kata Yai Beach — just a fifteen-minute walk away — make the SIS Kata a great choice for gay travelers who don’t want to choose between the late-night Phuket party scene and more upscale relaxation. The fact that the SIS Kata’s gorgeous grounds also feature a beautiful pool with direct views of the Andaman Sea only sweetens the already perfect location. The Anantara Chiang Mai is a picture-perfect luxury hotel with scenic river views, immaculate grounds and a friendly, helpful staff willing to go the extra mile to make sure that your stay in Northern Thailand is perfect. From a welcome massage while you await checkin to a beautifully presented afternoon tea, the Anantara Chiang Mai’s staff does everything you can think of — and sometimes, things you’d never have thought of — to make your stay a memorable one. Set beside a peaceful stretch of river front, the Anantara Chiang Mai is a secluded getaway that’s only a short walk away from the incredible cultural offerings of Chiang Mai, from the extensive night market to some of the best gay bars in Thailand. People come from all over Southeast Asia to see the performances on Charoenprathet Road, and they do not disappoint! Pro Tip, check out the Pride and Romance Package from Anantara to make your honeymoon stay extra special. The Dhara Dhevi Chiang Mai is, without question, one of the most incredible hotels in the world. Built by hundreds of craftsmen in the style of a Lanna village, the Dhara Dhevi Chiang Mai makes guests feel like they’ve taken a step through time, wandering the streets of an idyllic Northern Thai city. The villas — all large, luxurious and with individual architectural flourishes and floor plans — are secluded and peaceful, perfect for a romantic getaway. The grounds, which extend for more than 60 acres, are dotted with temples, ponds, multiple pools, and immaculate gardens. The Dhara Dhevi Chiang Mai’s staff is incredibly friendly and helpful, and will make it their mission to ensure that your stay will be nothing less than perfect. We can’t wait to return! On our honeymoon, the staff at the Dhara Dhevi Chiang Mai made us feel so welcome and appreciated, from upgrading our villa to booking the perfect dinner table, with a prime seat to watch a traditional Thai dance performance in between courses. The grounds are so large that you feel like you’ve got the place to yourself, which is wonderful for a romantic trip. The Pullman Bangkok Hotel G is a perfect spot for travelers hoping to pair a fantastic view of Bangkok with a quick walk to some of the greatest nightlife in the city. Silom is a fantastic neighborhood for food, sights and nightlife — particularly for LGBT travelers — with some of the greatest spots just a few blocks away. The rooftop restaurant and bar at Pullman Bangkok Hotel G has stunning views of the city’s greatest sights, and a cocktail list that can’t be beat. The proximity to Silom’s nightlife, as well as the smart, simple decor, make the Pullman Bangkok Hotel G a perfect spot for gay travelers hoping to hit Bangkok’s legendary nightlife in style. What was Thailand like as the destination for your honeymoon thinking as gay travelers?